No. 15 seed Middle Tennesee pulled off one of the biggest upsets in tournament history Friday, knocking off No. 2 seed Michigan State. No. 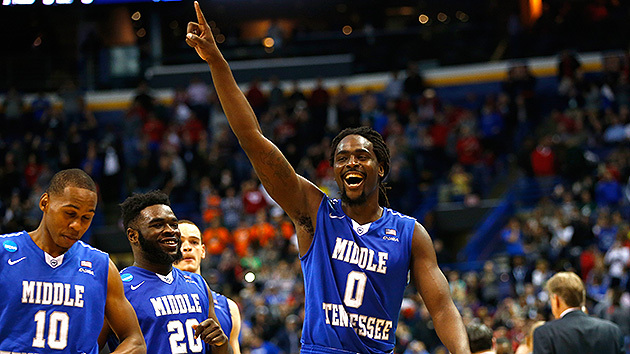 15 seed Middle Tennessee pulled off one of the biggest upsets in tournament history Friday, knocking off No. 2 seed Michigan State, one of this year’s title favorites, 90–81. Reggie Upshaw put an exclamation point on the win with an and-one dunk with 39.7 seconds left. The Blue Raiders are the eighth No. 15 seed to win a game in March Madness. The Spartans never led, though they did pull within one multiple times in the final minutes. Player of the Year candidate Denzel Valentine dealt with foul trouble and finished with six turnovers as his team lost in regulation for the first time since Jan. 20. Down three with 1:25 left, Michigan State let the Conference USA champs come down with an offensive rebound. Twenty-five seconds later, Giddy Potts hit a contested jumper in the lane to put MTSU up two possessions. All five Blue Raiders starters finished in double figures, led by Upshaw’s 21. Upshaw was 3 of 6 from three and his team as a whole shot 11 of 19 from deep. Middle Tennessee proved game for the challenge from the opening tip. Within five minutes, it held a 15–2 lead on a fiery shooting start, and the Blue Raiders maintained a six-point lead by halftime. That gap stretched to eight with 10 minutes left. But, within 90 seconds, the Spartans pulled within three on a Matt Costello dunk and a Bryn Forbes triple. Costello then scored again down low to get MSU within 1, 65–64, but Middle Tennessee built another lead and Tom Izzo’s team could not recover. Middle Tennessee is the eighth No. 15 seed to upset a No. 2, though this victory is arguably the biggest upset in tournament history, given that Michigan State was a common title favorite. This is MTSU’s first tournament win since 1989. The Blue Raiders will play No. 10 seed Syracuse Sunday in St. Louis. Only one No. 15 has made it to the Sweet Sixteen (Florida Gulf Coast in 2013). Syracuse dominated Dayton earlier Friday, 70–51.